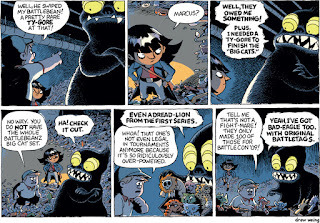 One of my favorite dark and creepy reads in October was a middle-grade graphic novel that is the start of a series: The Creepy Case Files of Margo Maloo by Drew Weing. This clever, creative story, told with imaginative illustrations, is perfect for middle-grade readers who want their books to be a bit spooky without being scary. Charles is not happy that his parents decided to move his family to Echo City, where his dad is fixing up a creepy old hotel to turn it into apartments. Charles misses his old house, his old (big) room, and his old friends. To make matters worse, one of his beloved Battlebeanz goes missing on his first day there, and he discovers a big, hairy monster living in his closet. Could this place get any worse? 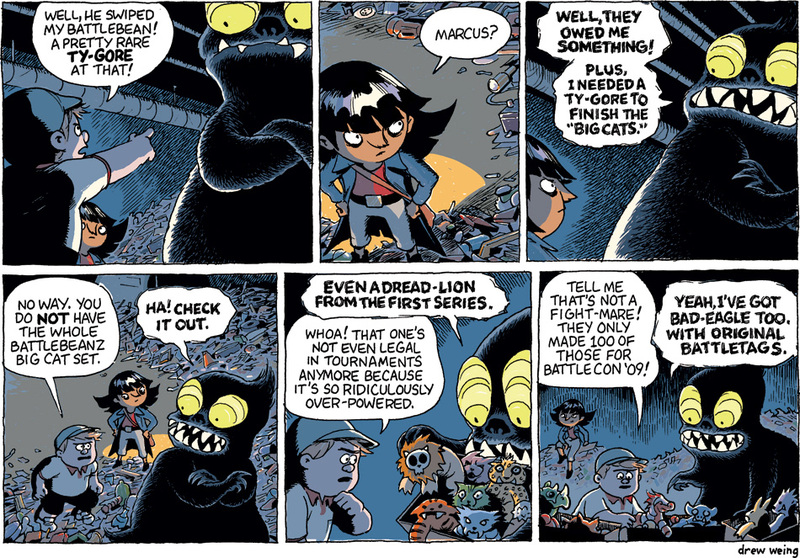 Luckily, Charles soon meets a new friend named Kevin, who warns him of the monster problem in the building and suggests he call Margo Maloo, Monster Mediator. Margo shows up in his window that night and turns out to be a girl about his age...but a cool, fierce girl who knows everything there is to know about monsters. She not only helps Charles with his own monster problem but brings him along on a couple of her other cases, involving a ghost disturbing some teenagers in an abandoned newspaper building and a missing ogre child named Millie. I absolutely loved this book! It is incredibly original and funny, showing a whole parallel world where a wide variety of monsters live right under our noses. Margo helps both monster and human clients, especially when their problems involve the intersection between their worlds. Along the way, she shows Charles a whole world he never knew existed, including monster bars and grocery stores. In this way, Margo shows Charles - and the reader - that monsters are nothing to be afraid of, if you just get to know them and respect their different ways of life. This is, of course, a lesson that applies equally well to the human world, though this book never feels preachy. The Illustrations are colorful and full of imaginative details that will have kids poring over them for hours, especially the few pages of monster encyclopedia entries at the end of the book. This first book was hugely fun and entertaining, and I can't wait to read book 2, The Monster Mall, which was just released in September. This series will be a hit in classrooms and perfect for reluctant readers. To see a few more sample pages (including one of the monster encyclopedia pages from the back), click on Look Inside at this link. 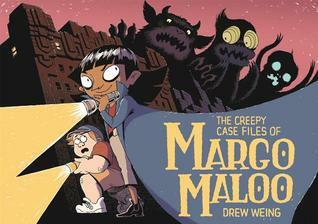 You can order The Creepy Case Files of Margo Maloo from Book Depository, with free shipping worldwide. This sounds fun, I hope it's on the list of CYBILS so that I can read it. If not, I'll get a copy after the judging is done. So much fun! This one - book 1 - was released in 2016, but books 2 - The Monster Mall - just came out in 2018 so it might be up for an award!